The Aqua Sphere Kaiman swimming goggles have Plexisol® blue lenses that offer great clarity of vision in the water and provide 180-degree distortion-free visibility. The lenses have an anti-fog coating and a scratch-resistant coating to protect them, and they shield your eyes from 100% of UVA and UVB light, meaning they can be used in confidence outdoors. The Easy-adjust™ buckle system makes it simpler and quicker to find a comfortable and perfect fit. for submitting product information about Aqua Sphere Kaiman Swimming Goggles - Blue Lens We aim to answer all questions within 2-3 days. 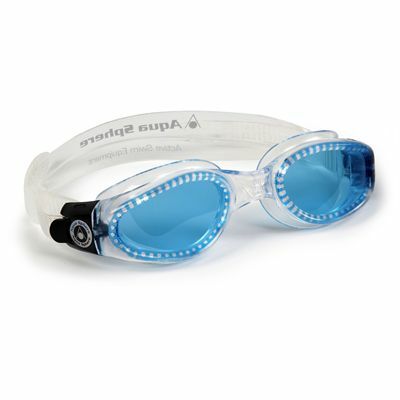 for submitting product information about Aqua Sphere Kaiman Swimming Goggles - Blue Lens. We aim to answer all questions within 2-3 days. If you provided your name and email address, we will email you as soon as the answer is published. for submitting product review about Aqua Sphere Kaiman Swimming Goggles - Blue Lens.